Is Detroit's Most Fabulous Ruin Finally Being Renovated? 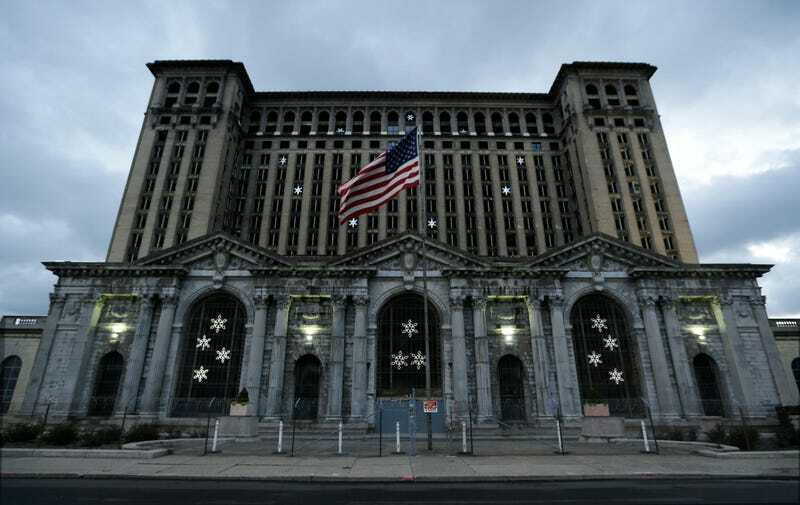 The owners of Michigan Central Station, the hulking, abandoned train station that is synonymous with Detroit's decline and has been empty for 30 years, have applied for permits to do construction on the building. What? This can't be right. Surely it can't be possible that the Packard Plant, Detroit's second-most-recognizable ruin, and the old train station are undergoing improvements at the same time. This has to be an elaborate ruse. Has to be. What will people gawk at when they're all fixed up? What will people write about in the meantime? Apparently so. The Moroun family, which also owns the Ambassador Bridge to Canada, have reportedly requested to put in a freight elevator in the building. "A new freight elevator is the next step of work on the Michigan Central Depot and will allow the smooth installation of windows and roof work as we continue to prepare the building for a new day," reads a statement to our local Fox affiliate. Obviously windows aren't going to do much for the old wreck; it needs a total rehab. But it looks like it's the first step toward finally doing something with the building. Or maybe the Morouns are feeling the pressure from Detroit Mayor Mike Duggan, who has recently said that owners of blighted commercial properties are due to receive heavy fines if they don't clean up. All signs point to the train station fixed up sooner rather than later. I predict apartments and lofts with ground-level retail. We're finally getting an Old Navy, guys!